As a new resident to Toronto in 2013 it was impossible to ignore the bright lights of Honest Ed's the first time I passed by the corner of Bloor & Bathurst, in the north-west of the downtown core. Opened in 1948 by entrepreneur Ed Mirvish, it rose to prominence as the destination in town for no-frills bargains. Met with some resistance in its founding years, it ultimately carved a place in Toronto culture thanks its huge storefront display featuring tens of thousands of flashing light bulbs and pun-laden slogans (Honest Ed's a nut! But look at the 'cashew' save!). You might compare its notoriety with something like Harrods in London - on the complete other end of the price & elegance scale, mind you - but a one-of-a-kind store that locals flock to & tourists read about in all their guidebooks. It became pretty clear to me that this place was an institution. 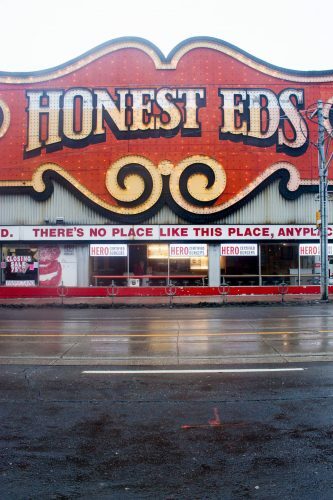 Unfortunately in mid-2014 it was announced Honest Ed's would close on December 31st, 2016 to make way for a new residential & commercial development. With less than a week to go, I decided to drop by one final time today with my camera to snap a few shots of this lovable Toronto landmark before it's gone forever.